Ford Canada sold fewer Mustangs in March 2014 than in March 2013, a not unexpected event given the car’s forthcoming replacement, but the Mustang still easily outsold its two most direct rivals. Camaro sales doubled, year-over-year, but only from a dreadfully low-volume March in 2013. Last month, Camaro sales were down 15% compared with March 2012. The Dodge Challenger is slightly less popular this year than last year, and together with the Camaro’s rise, is not the number two seller in the category as it was at this time last year. Mercedes-Benz Canada sold 51 SLK roadsters in March, which represents a three-unit year-over-year decline. The SLK managed, nevertheless, to outsell the Audi TT, BMW Z4, Jaguar F-Type, and Porsche’s combined Boxster/Cayman efforts. And the Mazda MX-5 Miata. Mazda is planning on replacing the MX-5 soon, but the New York Auto Show isn’t the venue for its debut. 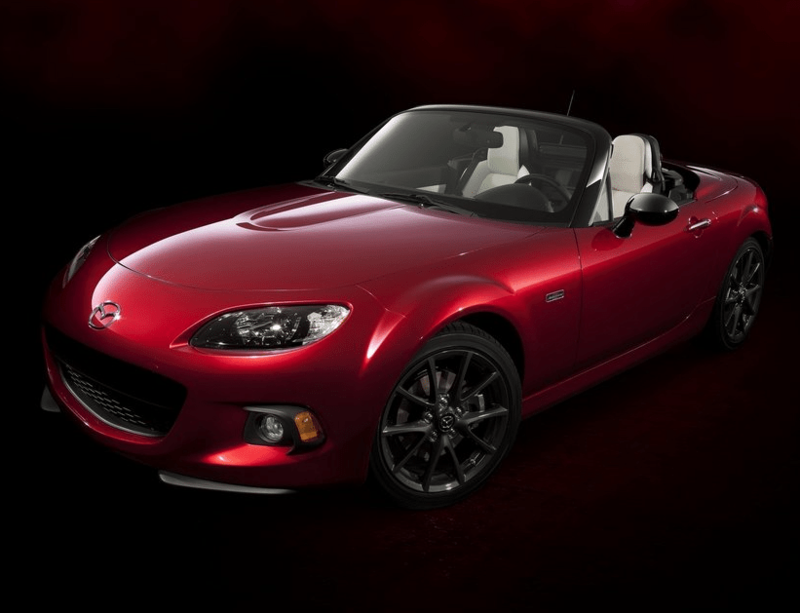 Mazda instead showed the new MX-5’s underpinnings and a 25th anniversary edition of the current third-gen Miata. We’re long past the point at which the world’s most popular roadster needed to be replaced: Canadian MX-5 sales in 2013 were down 69% compared with the 1814 sold in 2007, a year in which Mazda also sold 659 copies of the RX-8. Some of the cars you see below will have some very low-volume Italian competition in 2015. 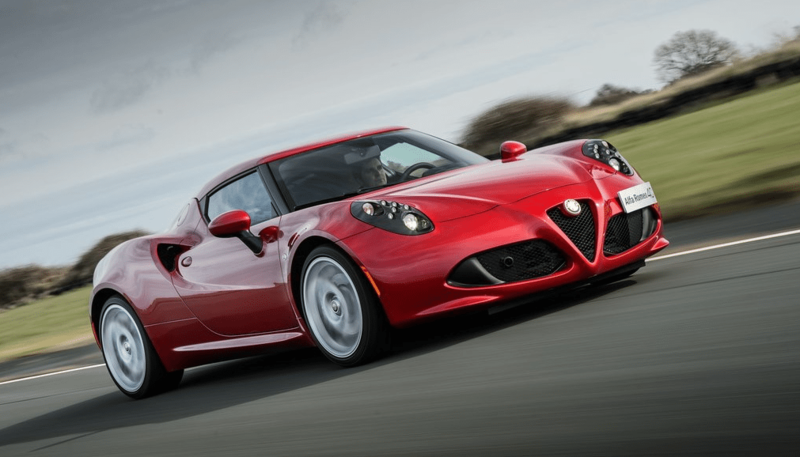 Alfa Romeo will sell the 4C in Canada – Chrysler Canada said so in a press release, and we’ve included an image above. But we’ve not yet been told out of which stores the Alfa will be marketed. 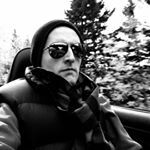 Fiat locations? The odd Maserati showroom? Alongside the… er, Ram 1500 Ecodiesel? 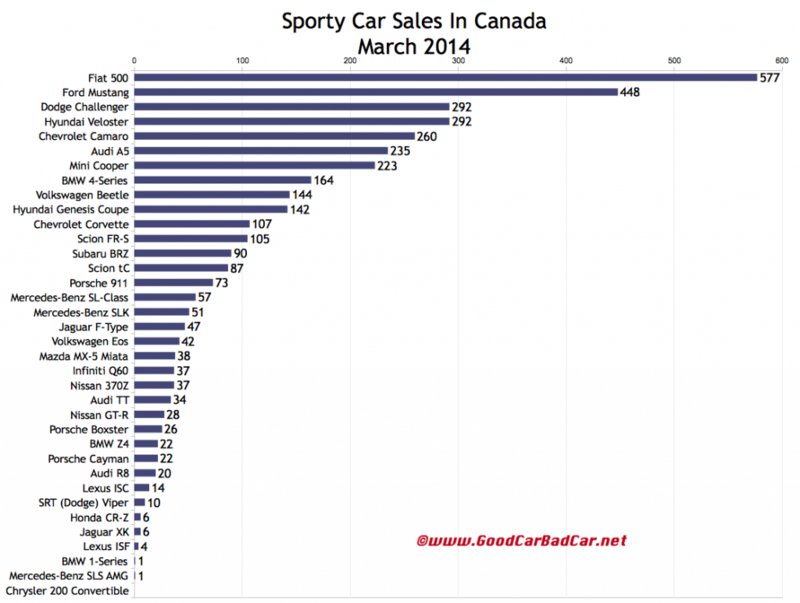 You can click any model name in the tables below to find historical monthly and yearly Canadian auto sales data. You can also select a make and model at GCBC’s Sales Stats page. These tables are now sortable, so you can rank sports cars, roadsters, convertibles, and wannabe hot hatches any which way you like. Suggestions on how GCBC should break down segments can be passed on through the Contact page.